A retired grandmother who prefers the quiet comfort of online casinos to the noise and smoke of Las Vegas recently won a progressive jackpot of $175,812 at her favourite online casino, Slotland.com. 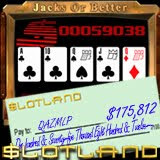 The player, known as QAZMLP, won the massive prize playing Jacks or Better, one of Slotland’s most popular video poker games. The avid slots player said she used to enjoy going to casinos in Las Vegas but nowadays prefers the comfort and convenience of online slot machines. The night of her big win was lucky from the start when the first hand she was dealt was a Full House in the first round. Although she’d started with small bets she took this as a good sign and increased her bets to $10. After a few more good hands she’d turned her $200 deposit into $500 in no time at all. “I honestly lost track of time with the best winning streak I ever had at Slotland but by the time I was dealt out the ultimate hand (I got the Ace, Queen, Jack and 10 of Spades and pulled up the King of Spades), I was almost at $1,300. With the $175,000 jackpot, I ended up with over $177,000. QAZLAP plans to pay off the last $30,000 on her house and then take a trip-of-a-lifetime to Japan via Hawaii. Slotland.com now offers fifteen one-of-a-kind slot machines and video poker games. They are all instant play casino games so there is nothing to download or install. Six of the most popular games, including Jacks or Better video poker, are also available on mobile phones and PDAs. All of Slotland’s slot machines, including the mobile versions, are tied to one progressive jackpot which was reset to $50,000 after the last win and is now almost $70,000. Slotland’s 3D casino, WinADay.com, has a separate progressive jackpot of its own. The jackpot there, where the new video poker game “Deuces Wild” was just launched, is currently over $125,000.